Caricature breeds Bombays and Burmese. They fill our home with their wonderful personalities, their beauty and their enjoyment of life. 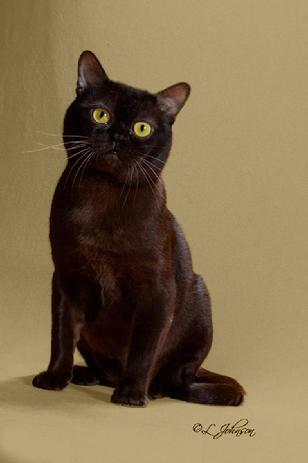 Visitors are greeted as new friends, and people who come to see our cats are always charmed by the bright-eyed, friendly 'greeting committee' that meets them at the door and, often, hops on their laps. Bright-eyed, curious, friendly, fearless - those are our kittens. We handle them from birth, they roll around and play with friends and family and visitors - a special treat! 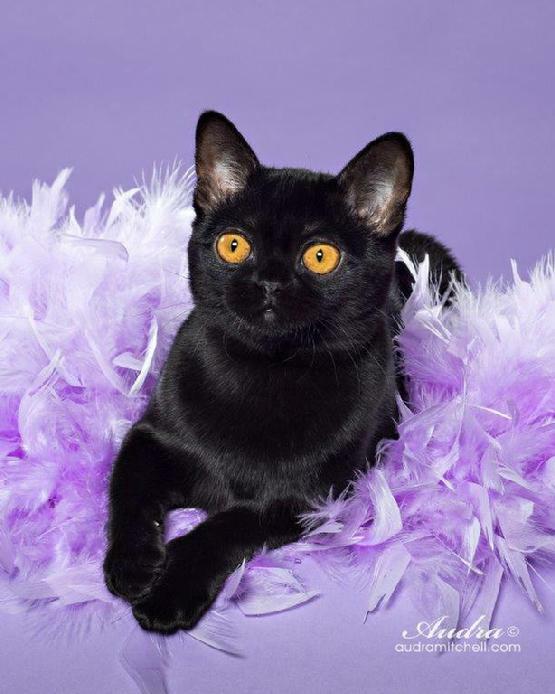 - and sometimes they travel to New York city for modeling assignments (see Cattery News for more information). Two princesses - with their guardian mouse! 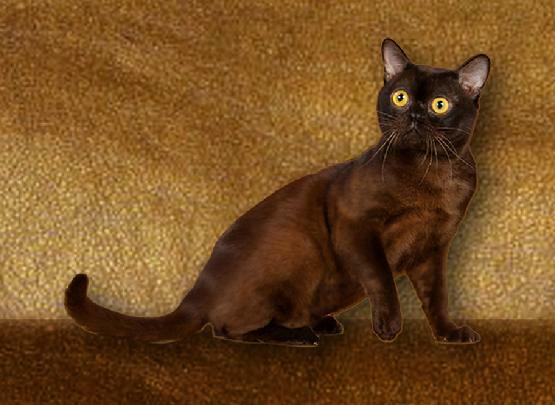 Bred by Isabelle Ruyssers and owned by Caricature, BB King was Eighth Best Cat in CFA. BB is the son of GC, BW, NW Star Academy Oliver Jones, and the grandson of GC, RW Caricature's Isaac Hayes, DM and GC Caricature's Nina Simone, DM. His mother is CH Caricature's Malia. He achieved his National Win in only three months of showing. Now he is at home with us, delighting us with the wonderful personality and beauty that made showing him such a joy, and is so characteristic of his breed. GC RW Caricature's Viola Davis is the third-ranking Bombay in CFA for her show season. 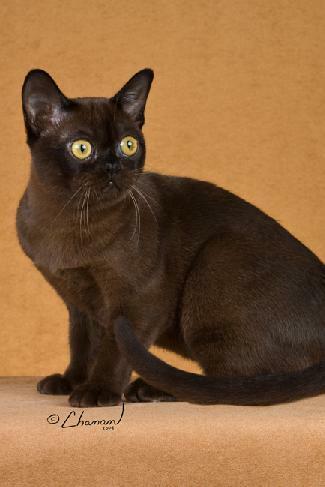 She is what we might term a 'double Regional Winner', since she placed in the top 25 cats in her region as a Kitten and as a Champion. 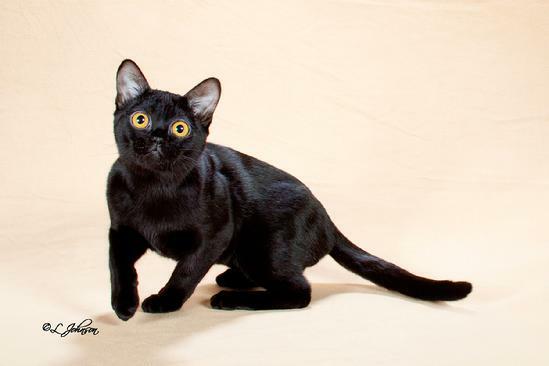 As you can see, she has the lovely, mesmerizing copper eyes of the wonderful Bombay breed and that gorgeous, rich black coat. She is a charming, lively addition to our home. 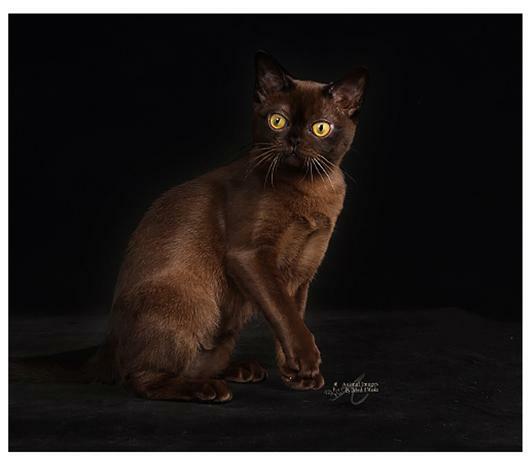 GC, RW Caricature's Lola Falana, named for the famous dancer, has the right name (just look at her photos, below!) Like Viola, she is a 'Double Regional Winner'. She delights us with her sweetness and charm. 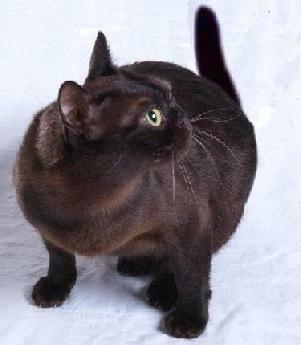 GC, RW Caricature's Josephine Baker has settled in to our cattery after achieving her Regional Win. We are enjoying her lovely kittens. She has achieved the distinguished title 'Distinguished Merit' for her beautiful, intelligent kittens. Sometimes things just happen. 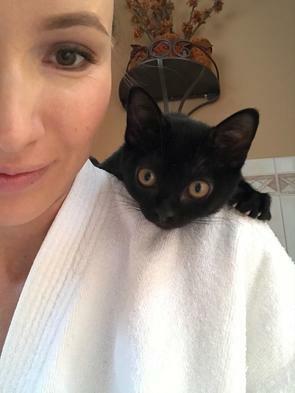 Kate met Denzel some years ago and fell in love with his beautiful eyes, his wonderful personality, and his beautiful, silly self. 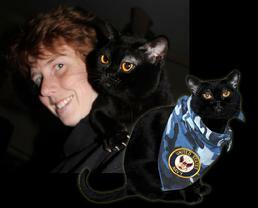 Kate also fell in love with Anthony, who is in the U.S. Navy Submarine Service. When Kate married Anthony, Denzel enlisted in the Navy, and accompanied them to Hawaii, where he is enjoying the beautiful scenery and the atmosphere of 'Aloha' while serving as the official mascot of the U. S. Navy Submarine the USS North Carolina. This Christmas he posed for a 'Mele Kalikimaka' photo! 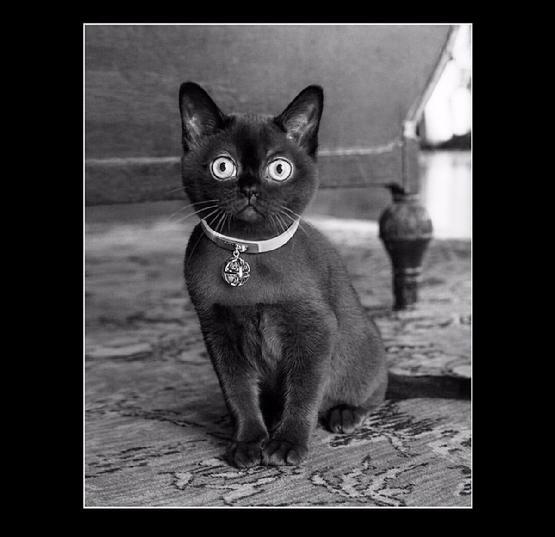 GC, RW Caricature's Gwendolyn Brooks (known as 'Gwen' here at home) was 15th Best Kitten in her region during her season. 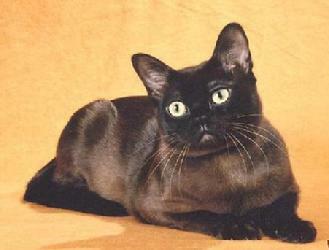 The daughter of Alice Walker and of Anzo, she's a Grand Champion now, happily retired. 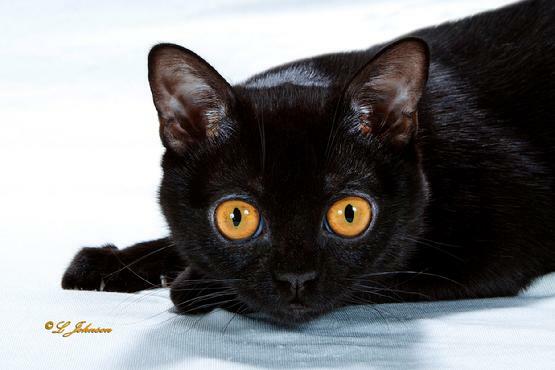 Bombay Kitten - All Eyes! 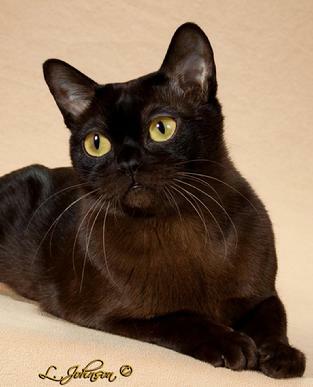 We at Caricature Cattery fell in love with the Burmese breed years ago. 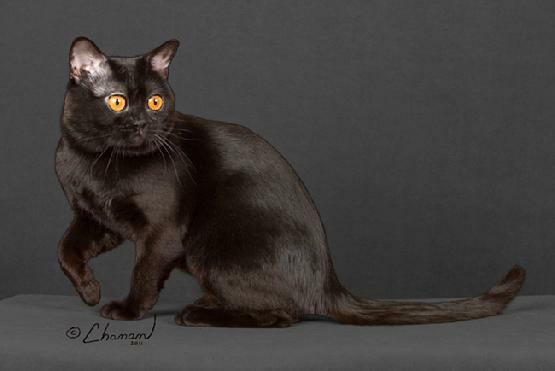 This mother-breed of the Bombay is notable for its wonderful, affectionate disposition and whimsical personality. 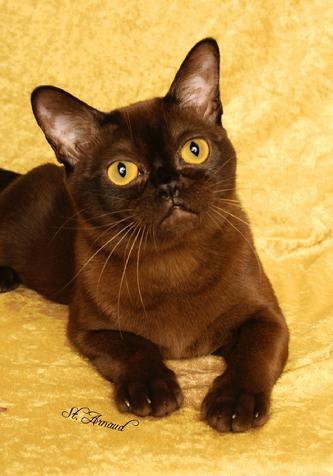 We deal exclusively with Sable Burmese - rich brown with golden eyes. 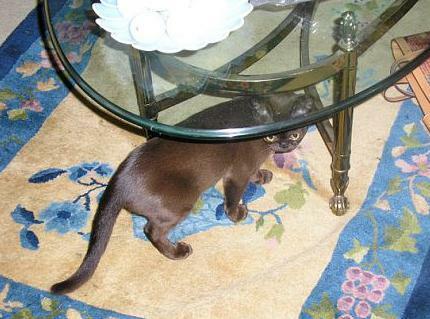 They delight us with their antics and charm us with their affectionate natures. Here are some of our Burmese beauties. Donato (GC, GP, RW Caricature's Donato Bramante, DM) is Patina's son and, like her, has the 'Distinguished Merit' title. 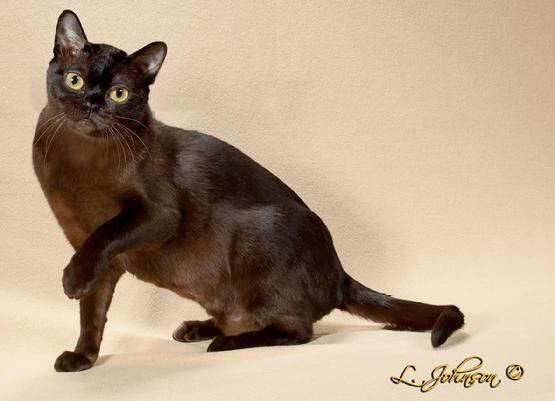 He is the father of many of our beautiful Burmese, like Donatella (named for him), Giada DeLaurentis, and some of our Bombays, as well. He is bright, friendly, and affectionate. 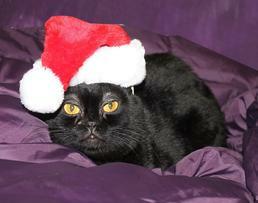 Over the years he has delighted visitors with his friendliness and charm, which he has passed on to his kittens. He is now retired, living close by with his sister, Frida. He recently went to a show in Massachusetts, and was his usual charming self. 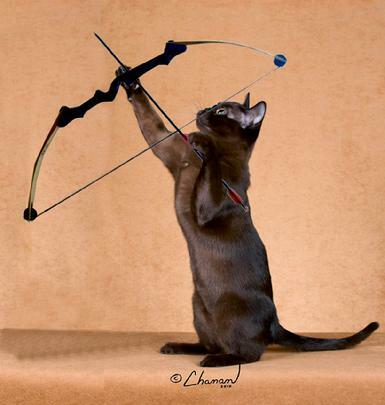 Here is a video of judge Gary Powell awarding Donato the 'Best Cat' designation. And below that is a sideshow of Donato for you to enjoy. Remy is the son of Donato and Siduri. 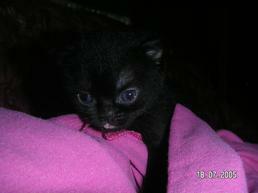 He has inherited both parents' wonderful dispositions and is responsible for many of our beautiful kittens. 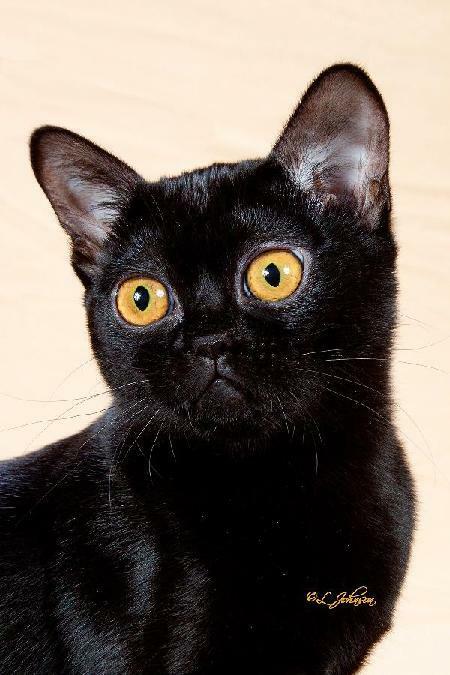 GC, RW Caricature's Giada DeLaurentis was a Regional Winner as a kitten this past season. As a Grand Champion, she is also a breed winner. She is a daughter of Donato, with his wonderful disposition and both parents' beauty. 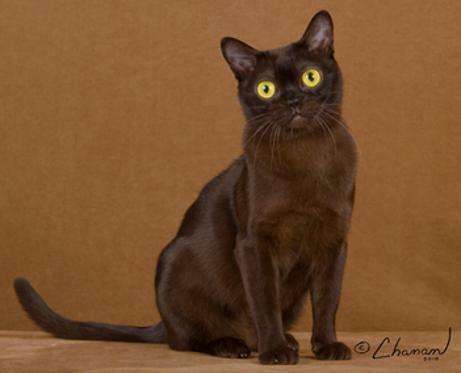 Imagine this delightful wide-eyed face greeting you in the morning! Remy is Donato's son, and he has been responsible for some lovely kittens. ...he grew up as beautiful as his father! 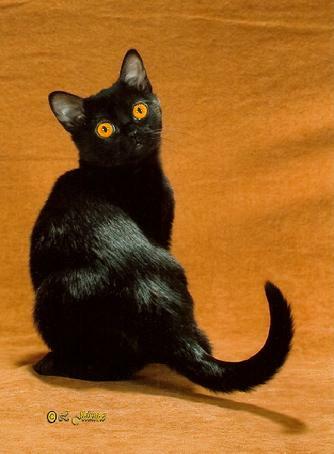 You can see from that flirtatious tilt of the head and those wide, golden eyes, Gypsy was well named. 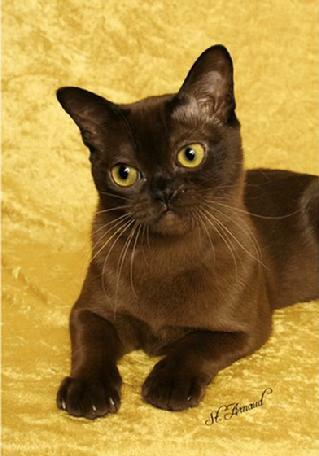 Silky brown fur, large, bright eyes, a wonderful, muscular body that is just ready for play or cuddles. She is a daughter of Shakira; her sister, Mata Hari, is shown below her. We love her and her kittens! And in March of 2016 she became our newest Distinguished Merit cat! 'Mattie' is Gypsy's sister. The two of them, named for famous femmes fatales of the last century, are charming, bright, lively and smart. 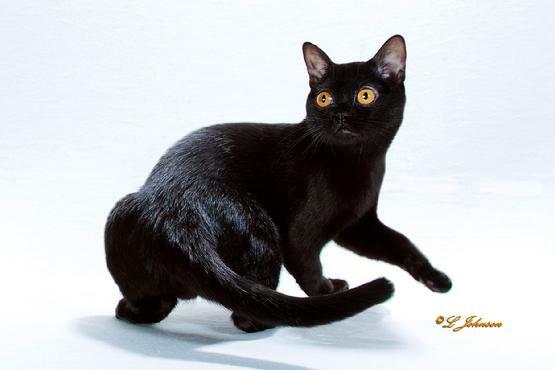 Siduri's beauty and disposition have been passed on to her kittens - so much so that she is Caricature's newest Distinguished Merit Cat, making sixteen in all! 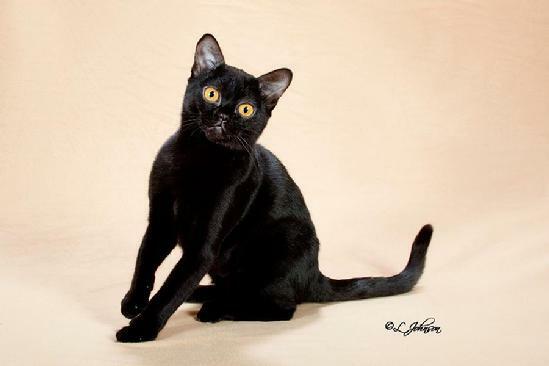 Siduri explored everything as a kitten, meeting and greeting visitors. 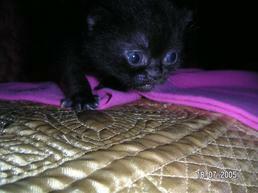 Now Siduri has kittens of her own, and she's enjoying being a mother as much as she loved being a kitten. 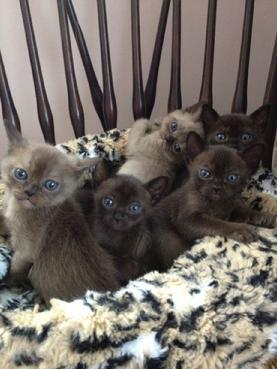 This is a collection of sable Burmese kittens fathered by Donato, with pretty Siduri as their mother. The little girl at the front right is enjoying life in Bologna, Italy. 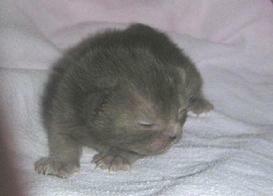 As you can see, Sable kittens are not generally born that rich brown color (see the kitten in the photo below). They darken and grow glossy as they grow. They're charming at any age! Who can resist a kitten? A mixture of whirlwind playfulness, sudden slumber and overwhelming sweetness - they charm us, exasperate us and make us laugh even when we're tired. 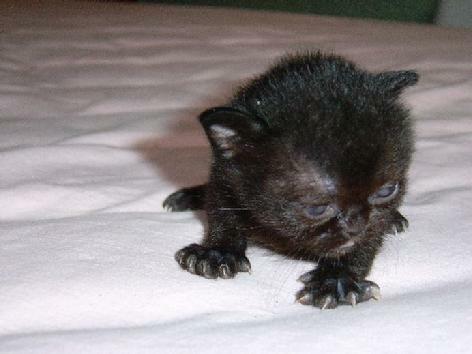 Enjoy this show of photographs of some of our kittens. 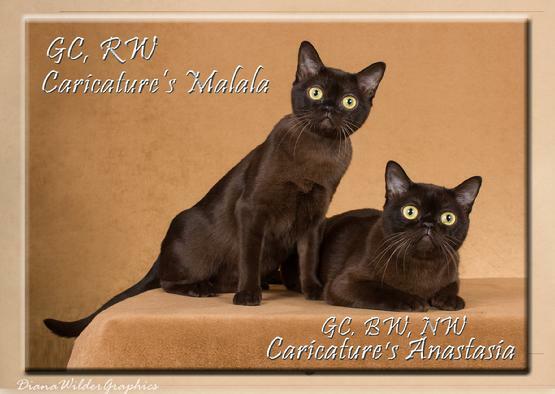 GP Caricature's Stella Luna caused a bit of a stir when she became a one-show grand at the Siamese Alliance in Lebanon, PA. This lovely girl is the daughter of our own Donato Bramante and Aung San Suu Kyi. She lives very happily in New York with her owner, a choreographer for the Rockettes, taking frequent vacations to visit her owner's parents in Massachusetts. We were delighted when her sister, GC, GP Caricature's Donatella, duplicated the feat. 'Ella' lives with her owner in central Pennsylvania. Kittens In A Basket, anyone? 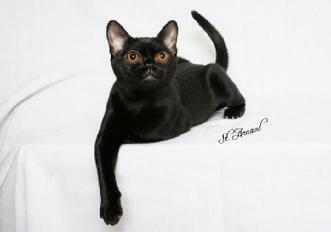 Our Sable kittens greet visitors, snuggle on laps, pounce on their buddies, roll around and generally love life. 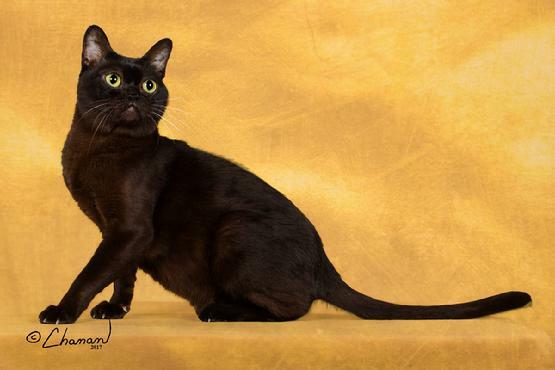 Like their Bombay cousins, sometimes they go to New York for modeling assignments (see Cattery News). GC Caricature's Mamie "Peanut" Johnson had given us some lovely kittens. We loved her, and when it was time for her to retire from motherhood, we were ready to keep her with us forever. 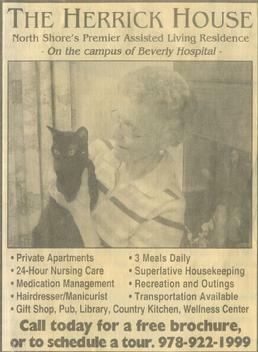 But when we returned from the vet with her after she was spayed, there was a message waiting for us: a lovely lady in a retirement community was missing her cat and needed a companion. We knew it was the perfect spot for Mamie. There was a photo of her on her new owner's door, waiting when we brought her there, and she settled right in and became a valued member of the community, spreading smiles and laughter, giving her owner purpose and enjoyment. Mamie's Forever Home was the best we could have hoped for.